Last week, in the Solr 6, SolrCloud and SQL Queries post, we described how the recent release of Solr 6 in its SolrCloud mode is able to understand SQL. But this is not the only SolrCloud / Solr 6. Another addition that we can use is the Solr JDBC driver. We can use it just like any other JDBC driver. 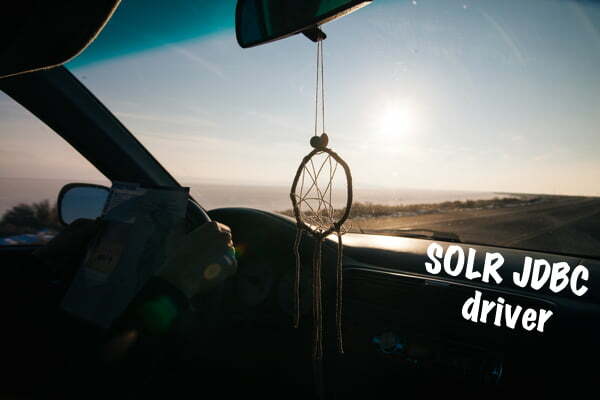 In this blog post we will show how to use Solr JDBC driver from our code, which should give you an idea of how to proceed when using this functionality elsewhere, say with Apache Zeppelin or any other data exploration or visualization tool that has JDBC support. Let’s look at using the standard JDBC driver API to retrieve data from Solr. That should be doable as we now have the ability to run SQL queries and SolrJ includes the JDBC driver. We do that so that Maven sees the additional library and allow JDBC driver usage. As you can see we’ve got all the documents from our gettingstarted collection (32 documents). Not all documents have the name field, thus we have some null values, but that is not important. What is important is that the JDBC driver allowed us to go through the results using the JDBC bridge. You need to specify the ZooKeeper address and the collection name when providing the connection string. You can see that on line 16 in the source code listing. We’ve specified the ZooKeeper address just after the jdbc:solr://, in our case we are using the embedded ZooKeeper, so it runs on the port that is 1000 larger than the one Solr is using. We also specified the collection using the collection parameter. We can also specify the aggregation mode and the number of workers that should be used. We use the defined connection parameters in the line 18 to obtain java.sql.Connection object that we will use as the connection to our collection. Once we have the Connection object, we can use it (line 20) to obtain the java.sql.Statement object, to be able to run SQL queries. Finally, on line 22, we are running the query itself. We do that by executing the executeQuery method on the Statement object that we already got on line 20. The executeQuery method will return the java.sql.ResultSet object which allows us to work with the results. We iterate through the results until the next method of the ResultSet instance returns false. If you need any help with Solr / SolrCloud – don’t forget @sematext does Solr Consulting, Production Support, as well as Solr Training! any ideas why this might happen? Couldnt find any clue till now,if some sql jars need to import?